If you have a window that gets a lot of sun you likely also have a room that gets so hot it could double as an oven. For those who want to cut down the heat, using air conditioning can be expensive and loud. Black-out drapes usually block more light than heat, and fans can only do so much. The two most common choices for people who want a low cost A/C alternative are foil insulation and shade screens. We’ve provided a quick breakdown of both to help you decide what will work best for you. If you are considering going the foil insulation route it’s best to know how it works. Foil, or reflective, insulation essentially functions like a mirror that reflects light and heat out of a given space. Typically, it’s used on windows that get a lot of sun exposure. Having just one window that gets a lot of sun can cause the room temperature to soar on a sunny day. 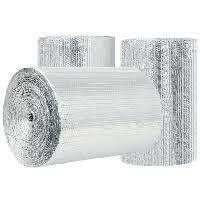 Foil insulation can be cut to size and placed over it as an effective heat blocking measure. For it to work effectively it must be hung on the outside of the window and it has to completely cover it. Unfortunately, this also means covering up your view and finding a way to attach it to the outside of your house or RV (usually tape). If the foil is placed on the inside, it means that sunlight is hitting the window and heat will still be able to get into the room as a result. The key to keeping a room cool is making sure the heat stays on the outside of the glass because once heat gets in it’s hard to dissipate. If you have double pane windows, placing foil insulation on the inside of the glass may cause the window seal to fail. The reason for this is that the foil is reflecting heat back through the glass panes causing it to super heat. 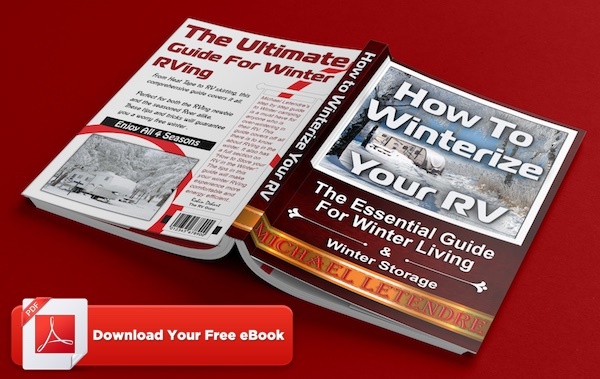 If there is a sudden change in temperature, like a cloud covering the sun, the stress from the metal expanding and contracting rapidly can cause the seal to fail. It’s the same principle for why applying tint on a window will void the manufacturers warranty. 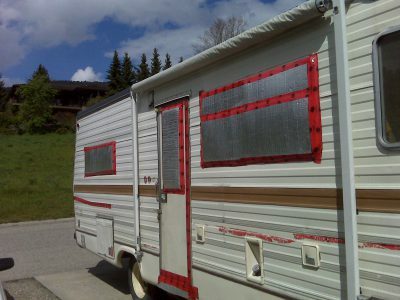 Foil insulation can also be an eyesore. 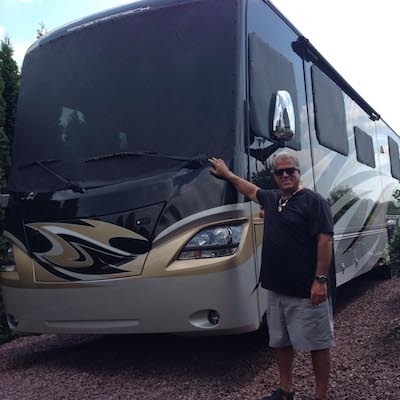 Having it attached to your window also means you are are essentially hanging a big piece of tinfoil to your home or RV all summer. Despite these drawbacks, foil insulation remains a popular choice because it’s cheap and effective. If you are thinking of going with foil, Reflectix is generally considered one of the best brands in terms of value for quality. Shade screen is a fabric that is designed to be placed over a window and provide shade. Just like the foil insulation it works best when attached to the outside of your window. There’s a lot of different varieties of shade screens on the market, so if you’re planning on purchasing shade screen know that they are not all created equal. There’s a lot of different brands out there and it can be hard to feel like you’re picking the right one. Some have irregular or uneven weaves, or some will give you shade but you also won’t be able to see through it. 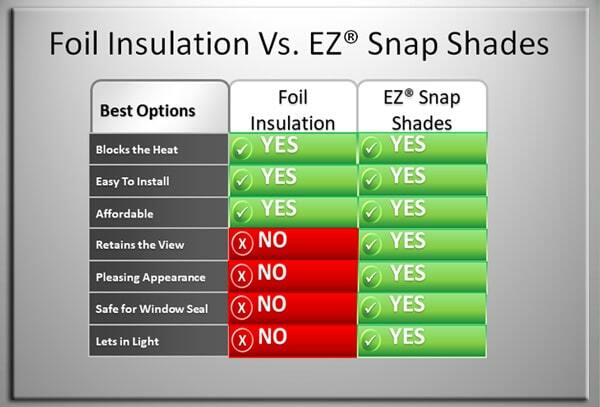 The best shade screen is from EZ Snap. It’s a patented product made from a non-fray mesh that blocks 90% of the sun’s heat. It’s also been designed to allow you to see out of it so you only block the heat, not the view. EZ Snap is attached with a stick-on stud, so there’s no drilling and no holes left behind. The mesh snaps onto the studs, so it can be taken on and off without much hassle. What’s also great is that a kit from EZ Snap comes with everything you need to install your shade mesh, so no frantic trips to Home Depot needed. When the EZ Snap mesh is hung it looks natural over a window, and while a lot of the heat is blocked, you still get a good amount of natural light coming through. 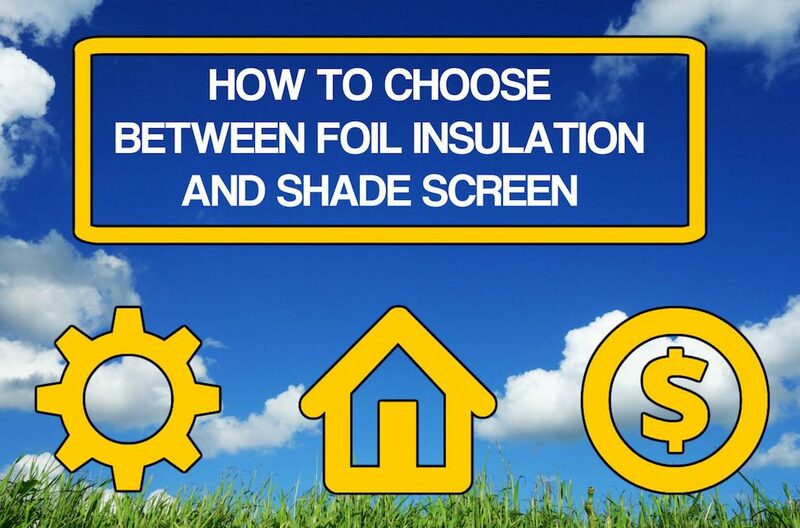 Choosing between foil insulation and shade screen comes down to a matter of preference and appearance. If you are in need of a quick fix then foil will get you through. 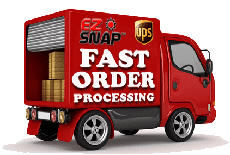 If you are wanting a more permanent solution that looks good, but still retains your view, then a product like EZ Snap shades is the answer.